She uploaded a total of 4 videos about the fake eggs. The first video is absolutely favored by her Facebook friends shared almost 3,000 times. A short less than 1 minute video the most profound quote is " All the eggs I have bought put inside refrigerator were broken ". " I speculated Fake eggs is now at the Malaysia shore". Through our the her video, she was not confident enough to say " yes, it was all fake eggs. " . It seem like not convincing enough for most of us because she said the outer layer of the egg the egg white is too much solid. From this point of view, it did not have solid evidence it was a fake egg until we see the next video. In the same day June 10, 2014, She uploaded the second video further proving her fake egg discovery. In the second video, she used English language rather than Mandarin. Nothing really happened until you see her third video about the fake eggs she bought. 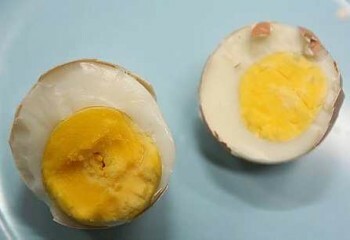 It was same date she uploaded her third video to her Facebook demonstrated the yellow yolk of the egg is like a ball . The white liquid at the side of the egg is "Chalaza"
Apparently, this women has little or no knowledge and experience dealing with fake eggs. The way she spoken could be affected by news articles and youtube video about "fake eggs". There were no real measures being taught into the Malaysian society what are the disadvantages cooking a fake eggs. Simply watching lots of Youtube video, they taught us one thing that the egg is made by chemical substances. Some of the chemical were harmful. If it was harmful why there were no precaution measures by respective governments ?? The silence of fake eggs by the authorities seem to imply that fake eggs is pretty much consumable that why there were no strict regulations to the food and beverage industries. Why there were no education program that improve our awareness on fake eggs?? Food and beverage companies is overpowered authorities nowadays ? ?